Another recommended site is Peter Howkins excellent RISC OS module database at http://www.marutan.net/db/ which is probably more up-to-date and certainly more comprehensive than the lists on this page. The modules listed below are the latest ones I know of for pre-RISC OS 4 systems. Some will be specific to various versions of RISC OS, and I've based it on a RISC OS 3.7 Universal Boot Structure. If you can provide more details on the purpose on any modules, please feel free to contact us. If you would like to check the authenticity of the modules on your system, and also ensure that they are virus free, I've provided a checksum against the original module. Where available, this is in the right-hand colum and is calculated using my !CRC application. These modules should be compatible with any version of RISC OS, and will be the ones loaded if no matching module is found whilst searching through 350.Modules, 360.Modules, 370.Modules etc. This is where any new modules you may install should go, and this directory replaces the !System.Modules directory found on earlier !Boot structures. CMOSUtils 0.01 (28 Feb 1996) ? This is where general purpose (ie. compatible with all versions of RISC OS [see above]) network related modules should go. Ether3-16 4.23 (13 Sep 1996) ? Ether3-8 4.20 (03 Aug 1995) ? EtherB 4.23 (13 Sep 1996) © Ant Ltd.
EtherH16 4.33 (27 Nov 1997) © i-cubed Ltd.
EtherH8 4.33 (27 Nov 1997) © i-cubed Ltd.
EtherM 0.39 (10 Apr 1997) © Ant Ltd.
Freeway 0.28 (03 Dec 1996) ? Internet 5.04 (10 Apr 1997) ? MManager 0.17 (08 Mar 1996) © Ant Ltd.
NetStatus 2.06 (01 May 1991) ? NetUtils 0.99 (29 Sep 1992) ? This is where general purpose (ie. compatible with all versions of RISC OS [see above]) Acorn Internet related modules should go. This is where general purpose (ie. compatible with all versions of RISC OS [see above]) wimp toolbox related modules should go. FileInfo 0.17 (14 Jul 1998) ? Modules in this directory are scanned before 310.Modules (above) and are used instead, if RISC OS 3.6 is installed. Modules in this directory are scanned before 360.Modules (above) and are used instead, if RISC OS 3.7 is installed. DDEUtils 1.54 (03 Jul 1996) ? When you type *modules you may find a number of modules which are not part of the standard RISC OS rom set. Although additional modules may be installed into the !Boot.Resources. !System modules directories, some are supplied within third-party applications and utilities. The modules listed here are various additional modules and what applications they came with. CPCLib 1.00 (31 Mar 1989) Pascal library compiler. TransBMP 1.00 (29 Oct 1994) Supplied with Computer Concepts !CCShared !TransBMP converter. TransGIF 1.00 (19 Oct 1994) Supplied with Computer Concepts !CCShared !TransGIF converter. TransICO 1.00 (17 Mar 1995) Supplied with Computer Concepts !CCShared !TransICO converter. TransMAC 1.00 (20 Mar 1995) Supplied with Computer Concepts !CCShared !TransMAC converter. TransPCD 1.00 (10 Jan 1994) Supplied with Computer Concepts !CCShared !TransPDC converter. TransPCX 1.00 (19 Oct 1994) Supplied with Computer Concepts !CCShared !TransPCX converter. TransWPG 1.00 (29 Dec 1994) Supplied with Computer Concepts !CCShared !TransWPG converter. As nearly all the modules in RISC OS 4 have been updated since RISC OS 3.7, it would be a bit pointless to list every module here. Suffice to say that most RISC OS 4 modules are dated 1998 or 1999, whereas most RISC OS 3.70 modules are dated 1996 or earlier. I shall thus list below the modules which are newer than those supplied in the RISC OS 4.02 roms. For those people who subscribe to RISC OS Select, I've created a separate page which details the RISC OS Select !Boot sequence. Please NOTE that any miscellaneous third party modules are still placed in the 310.Modules directory above, as the directory structure on RISC OS 4 is the same as the Universal Boot Structure, with the addition of a 400.Modules directory - which contains any RISC OS 4 only modules. Lastly, I shall give details of any development or 'beta-test' modules which may be available, such as newer 32-bit aware versions etc. As always, please feel free to contact us if you can provide additional information or don't understand something - or merely want to offer comments if you think these notes can be improved upon. The version of the 'Filer' module in RISC OS 4.03 is actually older than the version in 4.02. v1.97 is in 4.02, whereas v1.96 is in 4.03. The same for the 'NetFiler' module. v0.79 is in 4.02, whereas v0.78 is in 4.03. The same for the 'RAMFSFiler' module. v0.37 is in 4.02, whereas v0.36 is in 4.03. I haven't had time to create a comprehensive list of differences between RISC OS 5 and previous versions of RISC OS yet. Please check back later, or check the Iyonix web site. 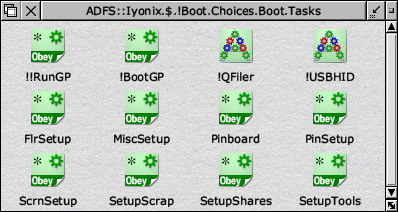 However, since the release of the original Iyonix, a number of !Boot upgrades have been provided and it's likely that your !Boot sequence may have some redundant files in it. If you're like me, you might not like the idea of unused files cluttering up the !Boot directories, so you may want to delete them. The main place that can get a bit cluttered is the PreDesk and Tasks directories inside !Boot.Choices.Boot. As of 9th December 2006 and running RISC OS 5.12 (26-Jun-06) I have the following contents inside PreDesk and Tasks respectively. · IClear is Martin Fox's module to allow precision drags and easily deleting text from icons. · MiscSetup is created by Paul Vigay's MiscSetup plugin. · QFiler is installed by Dave Thomas/Martin Avison's QuickFiler. · SampleRate is a small patch to fix the RISC OS 5 sample rate. See Peter Naulls site for more info. · WindOpen [v1.92 29-Oct-2002] is David Ruck's module for manipulating windows via the CLI. · SoftSCSI is required in order to read additional SCSI devices such as USB card readers and mass storage devices. · ~~USBHID is part of XAT's Human Interface Device software !HID. I have successfully deleted !!! !NewUSB, directory USB and ~LanMan229 which are no longer needed, as newer versions are built into the RISC OS 5.08 rom. · ! !RunGP and !BootGP are part of Martin Wurthner's !GimpPrint. · !QFiler is Dave Thomas/Martin Avison's QuickFiler. · !USBHID is XAT's Human Interface Device software !HID. · SetupScrap is my own patch for copying !Scrap onto a RAM disc at startup.